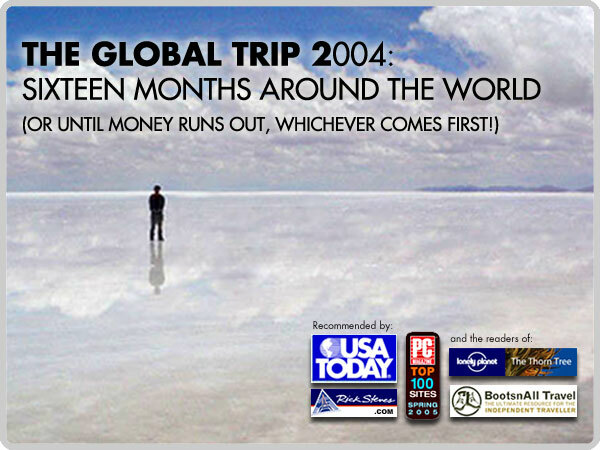 “The Global Trip 2004: Sixteen Months Around The World (Or Until Money Runs Out, Whichever Comes First! ),” is Erik's original travel blog that started it all. Sometimes funny, sometimes educational, and sometimes shocking — but always an entertaining distraction from office work — this blog of over 500 entries chronicled Erik's sixteen-and-a-half month journey around the world, which took him over 95,000 miles across thirty-seven countries on five continents between October 2003 and March 2005. Getting a traditional Andean music band to learn and play "Y.M.C.A." Getting recognized as a "celebrity blogger"
That’s what I told the Chief Operations Officer Paul Finer of ACTV in my exit interview when I got laid off on June 19, 2003. My Re-Birthday. Well, that was short-lived. After just three weeks of my break out into the travelogue column scene at Lycos-Asia, it is no more. AirTreks received my payment today for the first half of my flights, and the tickets are in the works. I should have them in a couple of weeks. I was only able to book the first half now, as airline ticket inventory only goes so far into the future. The other half I’ll book on the way. Perhaps by the halfway point my itinerary will be completely different, and I’ll just go where the wind takes me. Only time will tell. RECEPTIONIST: So how’s August 26th at 4pm? RECEPTIONIST: Just tell me what countries you’re going to now, so I can look them up before you come. ERIK: Sure. Um, you gotta pen? I’d like to give shout outs to Alice Mao and Rina Cantimbuhan for pledging to my cause. Thanks! Anyway, SAVE THE DATE: October 17, 2003. That Friday night in New York City will be my big bon voyage party — quite possibly the biggest party I’ve ever thrown. Those of you have been to one of my house parties may know what to expect. Well, be prepared to expect the unexpected. The past couple of weeks, I really haven’t been planning the trip so much; it’s been a lot more of taking care of unfinished business before I leave — freelance jobs, prepping my car for sale, cleaning, etc. That’s not to say I have ignored trip planning altogether…. Welcome to the All New TheGlobalTrip.com! When I originally started this website last year, it was just supposed to be a simple, single page where travel editors could quickly review my clips of published work. Q: What is the name of the song in “Would You?” and who is the artist? A: The name of the song is “Nara” and the artist is DJ/composer E.S. Posthumus. A tradition has developed between one circle of friends of mine: when we all go out partying, whoever does NOT decide to go out that night is inundated with a series of drunken voicemail messages. There’d always be at least one person who didn’t go out on a night of partying, and to this person (different every time), we’d call, pass a cell phone around, yell at them for not coming out and lay on the guilt trip. And we’d always end the voice message with crazy monkey noises. It is the night before I leave (well, technically, the morning of the day I leave) and I’m more or less all packed. Leave it to me to wait until the last minute. Once a procrastinator, always a procrastinator. In fact, I only tried to reserve my hostel for my first night in Quito earlier today, with no reply just yet. DAY 1: After a crazed morning of last-minute packing, a run to the Home Depot for luggage locks and some Dunkin’ Donuts bagel sticks, I had a final lunch at Chili’s with my parents and brother, who all took the day off to send me off. (You can all say “Aww…” in unison now, like the live studio audience used to do on Happy Days.) I short drive down the New Jersey Turnpike, and we arrived at Continental Terminal C at Newark Liberty International Airport. “Where is your returning ticket out of Ecuador?” the Continental Airlines attendant asked. “Oh, I’m just gonna take a bus into Peru,” I answered. DAY 2: I actually slept for a good nine hours, three times more than my usual back home. Outside I could hear the pitter-patter of rain and cars and trucks whizzing by. I just laid there for a while until I leaned over and noticed I had a roommate in the lower bunk across the way. “Hello,” he said. DAY 3: Yigal managed to leave for his 3am flight in the middle of the night without waking me or Judy. The only thing that woke us up was the sun blaring through our window around 8am. DAY 4: I woke up an hour before class and was off to take a shower, when I ran into Anna, this girl from Nebraska that I met in the TV lounge the night before. “Wanna get some breakfast?” she asked. I saved the shower for later and went out with her. We went wandering for a really cheap breakfast place. “Most of the places in the gringo district are pretty expensive,” she said. “I’ve been going to places about four blocks away where it’s a lot cheaper.” We found a small sit down restaurant where a full breakfast — including bread, eggs, coffee and juice — was only a buck sixty. “It’s funny when you think a whole two dollars is too much for a breakfast,” she said. DAY 5: I checked out of the hostel room around 8, managing not to wake up Lars, who was pretty much out cold anyway since he drank half a bottle of rum the night before in front of the TV. I left my bag with Carlos in the office and went off to class. Every Friday at the school, the second half of the morning classes go on a field trip somewhere in town. A las once, four of us students, plus all of our teachers headed off to a museum of Ecuador’s history, in the Old City. One of the students was a tall, lanky Dutch guy named Hugo, who towered about 6’5”. He was one of those goofball gringos that didn’t care how embarrassed he’d get talking to locals, knowing that they’d just brush him off as a gringo. Using his broken Spanish, he managed to buy candy off a blind man on the bus. DAY 7: I learned a new expression in Spanish today: “Su banco es esta fuera de linea.” Translation: “Your bank is off-line.” I have decided this is my least favorite Spanish expression so far. DAY 10: In South America, I’ve noticed that most of the hot showers are electric. A pipe runs to a shower head which is connected to two electric wires, which run a power switch. As water enters the shower head, it heats it before it comes down. The problem I’ve found with this is, when a fuse blows in the house, like it did in the morning, the water immediately gets freezing cold right when you have shampoo all in your hair. I blamed my iBook in the bedroom, which had been plugged in and rendering a video file for a New York client for the past two days. If it’s not one thing with clients, it’s another. DAY 11: I think that I’m learning Spanish a lot quicker than the other students in school. I don’t know if it’s because I took French in high school and the language is very similar, or because I come from Filipino heritage and Tagalog borrows many words from Spanish. All I do know is that most students I’ve spoken to are doing way more written exercises in class (and for homework), while I’ve moved on to more conversational work. DAY 13: “Did you go out partying for Halloween last night?” a Danish blonde asked me in the back of a truck at 8:03 in the morning. She saw that I looked pretty exhausted. And so began my trip to Cotopaxi, the highest active volcano in the world, just 90 minutes south of Quito by car. DAY 14: After breakfast, I updated The Blog at the German computer nerd’s internet cafe around the corner. Outside, all the stores were closed for Sunday and even in GringoLand it looked like a ghost town. Arne said it reminded him of the movie 28 Days Later. DAY 15: My morning started as always: getting out of bed to take a piss. However, this day it was different. In the center of the bathroom, atop a small drain gate, were three turds. DAY 17: For the past week and a half, I had fallen into a routine in which I’d wake up, shower and have breakfast with Arne and Blanca. Things were different this morning. It was Arne’s last day in the house, since he was planning to move to his friend’s place a couple of days before he starting work in a hospital the following week. DAY 18: Back in the days when I had a 9-5 American corporate job, I was only allotted the miniscule vacation time of two weeks. Two weeks, compared to other countries, is an embarrassingly short period of time and I would always use these two weeks to rush through a destination, doing one thing after the other after the other to pack it all in. I slept very little in attempts to make two weeks seem like three. DAY 19: I had my last breakfast with Blanca in the morning, which was a good and bad thing. A good thing in that I was getting fresh food and a lot of it served to me on a ceramic platter with no effort on my behalf. A bad thing because — just as every morning I’d been living there — it was way too much food for me so early in the morning and I almost had to force myself to eat the whole thing. My stomach simply can’t handle a huge plate of fruit three inches tall plus an egg and bread and juice and a cafe con leche. I think for once I would have actually preferred just having some McGriddles. DAY 20: Baños is a town in a valley surrounded by lush green mountains, one of which gets really excited and ejaculates liquid hot magma every so often. In 1999, the Volcán Tungurahua erupted, causing a major evacuation of the town, and since then the town has been on guard. In Baños, after you look up the weather forecast, you look up the volcano forecast. By the time you finish reading this blog entry, you’ll see what he means. DAY 22: Navid had moved to my hostel since his other was too noisy, so it was easy to find him for breakfast. We played a quick game of generic Jenga before looking for the other thermal baths of Baños on the outskirts of town. DAY 23: Whenever I’d walk around with Navid on the streets of Baños, newly arrived backpackers would always stand out with their big packs strapped to their backs and their smaller daypacks strapped in front. This is like trying to simulate being both pregnant and a camel at the same time. DAY 24: Once upon a time in Ecuador, the railway system was the fast way to go north or southbound through the Andean countryside. Over the years, this railway system was replaced by the faster and cheaper bus network. But there is one train that still runs, so that tourists can ride on the roof and take pictures of the countryside faster than the locomotive. DAY 25: Being in Cuenca, Ecuador’s third largest city, is like being in Old Spain. With its well-preserved Spanish colonial houses and cobblestone streets, it’s no wonder it was declared a World Heritage Site in 1999. The red-roofed houses, the plazas and cathedrals make it one beautiful city with — I later discovered — beautiful women. DAY 26: In modern life, the “norm” is to work most of the time, with a day or two off to “smell the roses.” Well, as I’ve been “smelling the Ecuadorean roses” all this time (as well as the bus fumes), I needed a day to just do some work. So I took a day “on” in Cuenca. DAY 27: “You know what I heard?” Anita said at breakfast. I had met Anita in Spanish school in Quito, and we had both finished and headed south at about the same time. She and her friend — I forget her name — were having breakfast at the cafe in my hostel in Cuenca and were planning to head to the Peruvian border afterwards. “I’ll probably see you somewhere south,” I said. DAY 28: In Spanish, the verb esperar translates into two things in English: “to hope” and “to wait.” This is especially noteworthy when you are waiting on the “Linéa de Espera” for a standby seat to open up for the Galapagos Islands at Guayaquil airport. You wait on line and hope to get a flight. DAY 29: Andre and I were lounging out on the hotel terrace, watching the sun rise over the bay as the sounds of ocean waves crashing into rocks filled the salty sea air. Nearby, three seals were lazily sitting in someone’s boat. DAY 30: Andre was up by six to get the 7:15 shuttle bus & ferry back to Isla Baltra (where the airport is), to hop on his boat from there. I assumed he got on the same bus as Chris as I stayed in bed for another hour. DAY 31: When Andre moved out of our hotel room with a view of Pelican Bay, I was switched to a single which cost me $15/night. However, this newer, more expensive room wasn’t worth its view of a brick wall, so I switched to the hostel Chris had lived in for only $6/night with windows that looked out to some palm trees. DAY 32: Three kilometers west of Puerto Ayora lies Bahia Tortuga (Turtle Bay), with a white sand beach open to the public. During the high season, I can imagine it being crowded with beachgoers and surfers, but it being the lowest of the low season, I had it all to myself. DAY 33: Rosa, the old woman that ran the Los Amigos hostel, let me use the big sink in the yard to do my laundry. We chatted for a bit while I scrubbed my underwear, about this and that in Puerto Ayora. She seemed happy to talk to one of the travelers; most of them just kept to themselves and lived in a bubble, never interacting with their hosts unless they needed something. What’s A Motto With You? Will The Real Mongolian Please Stand Up? If It Wasn’t Entertaining, It Wouldn’t Be P.C.